As a mother we always want The Best for our kids. Best of everything , which also includes Baby Products. Since it’s a part of their skin care routine. We want to use Chemical free & Toxin free products which are gentle on skin and safe to use. 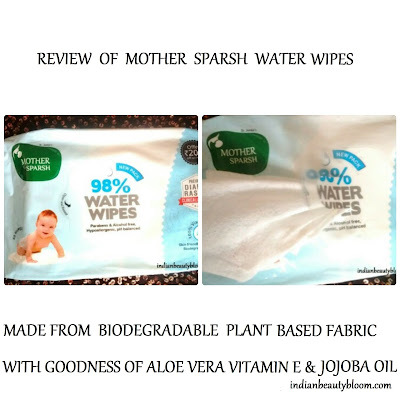 Mother Sparsh is one such brand whose products are safe to use . It’s an Ayurvedic brand and it’s products are Paraben Free , Alcohol free and uses natural ingredients in it’s products . 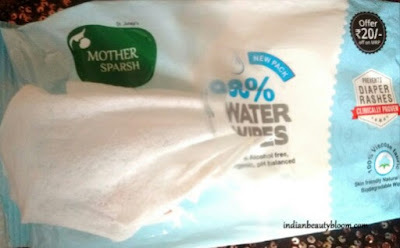 One of it’s products which I have used and found too good is Mother Sparsh Baby Water Based Wipes . It is made from biodegradable plant based fabric and it enriched with Aloe Vera , Vitamin E and Jojoba Oil . 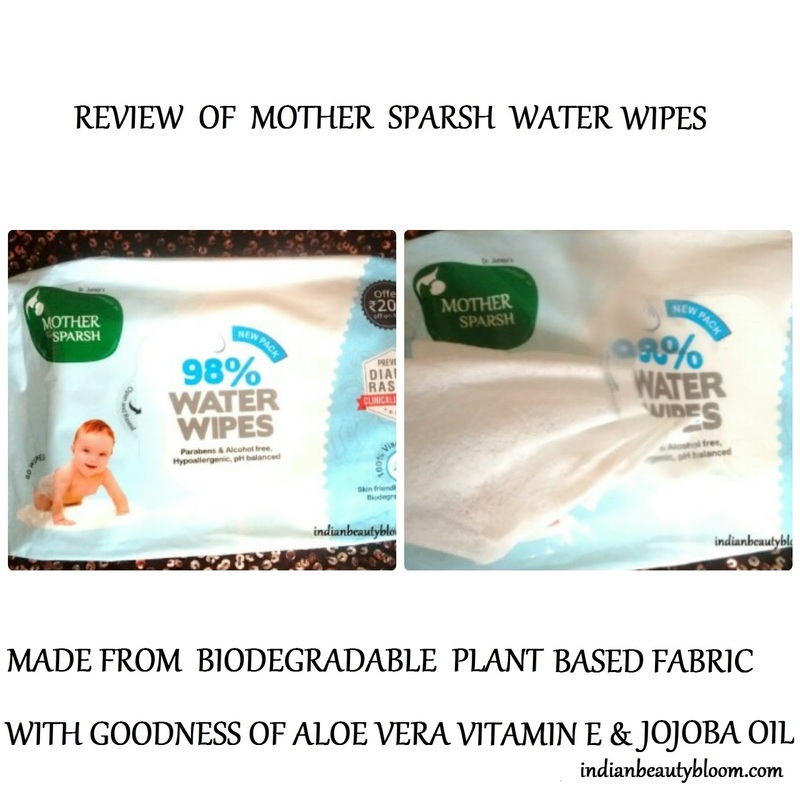 It’s a Polyester free baby wipes which is PH balanced and is Skin friendly. These wipes are packed in a pull off package , from which one can easily pull one wipes to use and can then seal the pack to maintain freshness of other wipes . These wipes are quite thick and do not tear while usage. Smells good as is enriched with Aloe Vera and Jojoba oil . 1. Made from 100 % biodegradable plant fabric . 2. 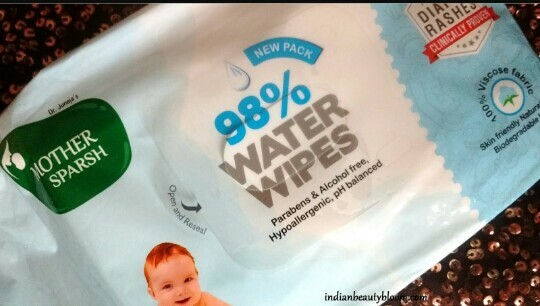 98 % water wipes so as good as cotton and water . 3. Free of harmful chemicals like Paraben , Artificial color & Fragrance etc . 4. Has goodness of Jojoba Oil , Castor Oil , Aloe Vera . 5. Its Dermatologically tested and Hypoallergenic , So safe for baby’s skin. 6.Good quality product and it prevents diaper rash . 7.. Easily available on online stores like Amazon . 10. An eco friendly product . I have used this myself to check it’s quality . It’s a good one . The wipes are thick and can clean skin gently . Ideal for infants and small kids . Even suitable for new born babies . 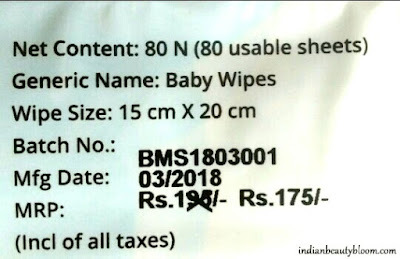 One can use these wipes to keep baby clean and maintain hygiene , these wipes can be used while changing diaper or just to fresh up the baby , so that baby feels good and refreshed . 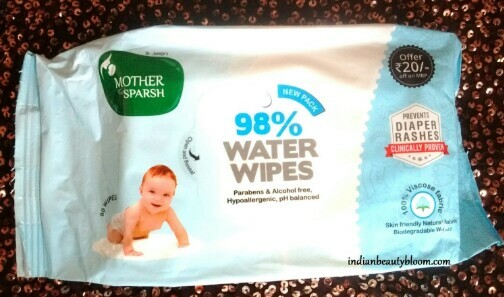 So all these makes Mother Sparsh Baby Water Based Wipes Unique , Special and Better than other wipes . Do share your views if you have used this product .